MintyTheCat wrote: "All DDD things related..."
Already solved, i was invoking "ddd.sh 8000 menu.elf" (which works on my debian laptop) then loading a rom...that crashed DDD and console. So i only used "ddd.sh 8000" and thats it. Its strage since i can load menu.elf in the laptop without problems...but meh i dont care anymore it works now. This can be somewhat confusing in the wiki...for dummies like me...but since we make this for getting dummies into megadrive programing it should be a good idea to explain this on wiki. MintyTheCat wrote: Montserrat: did you get the E-Mail that I send to you last night with a working Assembly project included? Heyo! I had to reinstall my OS for other reasons, so I thought I'd give setting up UMDK another try on a fresh install (before I install the SGDK / Gendev stuff). It seems happier, and the build is coming along without the visible errors I had early on before. I'll report back how well this works. Sorry, what build? If you're using the 20151220 binary distribution as described on the wiki you shouldn't have to build anything yourself. I've been out of the loop, I was going on the page 1 instructions still. That's great binaries are available, I'll have a go at that soon. mikejmoffitt wrote: I've been out of the loop, I was going on the page 1 instructions still. That's great binaries are available, I'll have a go at that soon. OK, I removed the "how-to" posts, to stop it confusing anyone else. Good luck! Hey! Yesterday I did repair asia MD2 with VA1 board. It randomly hangs on some games and did not run my FLASH cart. Investigation lead to AS signal capacitor, that missing on board! In fact, there is on schematic! Moreover, this AS affect to raster effects. For example, trembling letters "GOLDEN AXE" or screen flashing in two player mode of RRR when Larry talks. So, this all about AS timings everywhere. In UMDK you can just delay it by some ticks of FPGA clocks. HardWareMan wrote: So, this all about AS timings everywhere. In UMDK you can just delay it by some ticks of FPGA clocks. On my UMDK, this command is fine, so it's not a problem with udev rules or any such configuration. Voltages all check out as fine on the board, and the Cypress device does enumerate properly in lsusb. Model: "Cypress CY7C68013 EZ-USB FX2 USB 2.0 Development Kit"
Vendor: usb 0x04b4 "Cypress Semiconductor Corp."
Device: usb 0x8613 "CY7C68013 EZ-USB FX2 USB 2.0 Development Kit"
You can see that the culprit here is the "usbtest" module, hence the need to blacklist it. If you see some other driver grabbing the FX2, you'll probably have to blacklist that too. I may not have been clear enough in my post, but I stated that if I use my PCB (as opposed to his) it works without any issues. I've tried it as root, which didn't help. I will see if hwinfo shows anytihng useful though. mikejmoffitt wrote: I may not have been clear enough in my post, but I stated that if I use my PCB (as opposed to his) it works without any issues. I've tried it as root, which didn't help. I will see if hwinfo shows anytihng useful though. 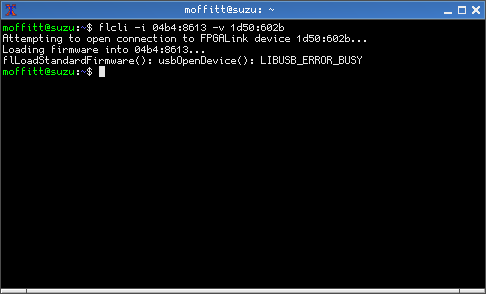 But your PCB has had the FPGALink firmware installed, so it'll enumerate as an FPGALink device (1D50:602B) whereas mswan's will still be enumerating as a "vanilla" FX2 device, which is what triggers the usbtest module load. Temporarily remove J1 from your board and you'll most likely get the same behaviour. Sure enough, that did help. We're going through the last tests now. I've been casually following the action here and finally this has spurred me on to take another look at my board set which was left, sick and fevered, on my workbench sometime around Wed Aug 13, 2014. I'd made a stupid mistake when building the board and omitted two vital resistors (D+/- pull-ups on the usb IIRC) which resulted in the FX2 being invisible. This led to some serious, and unnecessary, rework - and the eventual lifting of a couple of pads at the FPGA. I was a little ... impatient. Anyway I'm a lot^k^k^k bit more patient now and having had a lot of practice with ultrafine tqpf and the reworking thereof I decided to have another look at the board. I cleaned up some solder joints, repaired the lifted traces and, following Chris' excellent advice about testing the mechanical linkage 'twixt pin and pad, I set about with a needle and microscope. I found an open joint on the FX2 and a well hidden bridge on the FPGA. The early board tests all passed and I could checksum the content of the chips. Success! The board was only 3/4 populated though - I was testing as I built - and of course I couldn't find the last remaining parts. Farnell have come through and now that the EEPROMs are in place I'm pleased to announce that - pending a test in the old MD - I appear to have a fully working board set! I have 3 PAL MDs, a region modded MK1 and 2 MK2s. I don't know what revision these are but I'm happy to rip them open to find out. I have to admit that my megadrive ambitions are, at this point, vague to non-existent but I will be more than happy to execute tests or experiments and hopefully add to the knowledge pool. If I can get my head around this system then I'd like to use it as a Z80/6502 ICE. I am glad to hear that you have yours up and running.